Research-based, rigorously accurate, and yet it is still an easy read. The table of contents is detailed so readers can easily find a specific topic. Covers a wide range of topics drawn from the everyday life of families with children with ADHD. This book focus mainly on what parents are dealing with at home rather than school concerns. As with any intervention, success will depend on how well parents apply the strategies provided. This well-written, easy-to-read book is designed for parents of children with ADHD to support at home behaviors. Even the table of contents is useful and well organized, outlining the key information that parents of children with ADHD need to know but might not otherwise focus on. The book covers the typical information of how ADHD impacts a child’s behavior, academics, and social skills. However, it also delves into the key role that parents play, including why it is critical - and how – to create calm. Each of the 8 "Keys" is approximately 20 pages long and closes with a couple of “guiding thoughts” as well as some specific ideas or action steps to make the book easy to refer back to when life challenges arise. The author also makes good use of simple but effective illustrations to make a point as clearly as possible for those who might skim or lose focus while reading. Overall, this is a very helpful guide for parents that uses a soft touch and can provide comfort to parents while coaching them on how to be understanding yet firm with children. If parents find this book helpful, they can sign up for the author's 7 part webinar on which the book is based. Combining expert information with practical, sensitive advice, the eight "key" concepts here will help parents reduce chaos, improve cooperation, and nurture the advantages―like creativity and drive―that often accompany all of that energy. Based on author Cindy Goldrich's seven-session workshop entitled Calm and Connected: Parenting Kids with ADHD©, this book focuses on developing and strengthening effective interpersonal skills in both parents and children as a way to improve conflict resolution. Following the parenting principle to "Parent the child you have," Goldrich offers advice to help readers tailor their parenting to meet the needs of their unique child. The book also leads parents to recognize the value of being a leader and a guide to children, building parents' confidence in their decision-making, and giving children a sense of safety, security, and confidence. 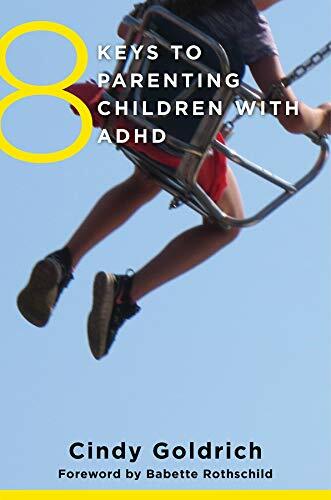 The principles outlined in 8 Keys to Parenting Children with ADHD are appropriate for parenting kids of all ages―until they have "launched" and are on their own.